Bookings Open for Direct Management Quota PG Medical Courses viz. MD, MS & PG-Diploma Admission in best Private Medical Colleges of Karnataka & Maharashtra for 2016-17 academic session on the basis of first come first serve at possible minimum donation and fees...Don’t Miss the Chance...Grab this opportunity. Pick your Phone and Call TRUMP Career Solution on +91-9742479101 (Ankit Mishra), +91-9742886036 (Anis) & 080-42173206 (Office-Reception) to confirm your bookings before its being too late. The biggest option for which everyone is looking forward to after completion of their Under Graduate Medical MBBS Course. It is as hard as it is charmful to do this. This is because there are very less number of Post Graduate Medical Seats and they are even few for each speciality. It is very hard to keep up your passion (course of interest) and college of interest at the same time, if you have to get a seat under merit quota. Usually many of them take long breaks of one to two years (if serious) to prepare for the PG entrance. One has the option to fight in the entrance of their respective states or in the central exams like AIIMS, JIPMER, PGI Chandigarh, CMC, COMEDK, AMUPMDC...etc. There are several types in going for a specialization. One is a 3 year M.D/M.S course, second one is a 2 year PG Diploma courses like DCH (Diploma in Child Health), DGO (Diploma in Obstetrics & Gynaecology), DMRD (Diploma in Medical Radio-Diagnostics)...etc. Apart from these two you have an option of DNB (Diploma of the National Board) in all of the mentioned specialities. It is equivalent to Doctorate (MD) course as it is also of 3 year duration. DNB can be obtained by clearing the centralised entrance test after completing three years of postgraduate training in hospitals recognised by the national board, New Delhi. 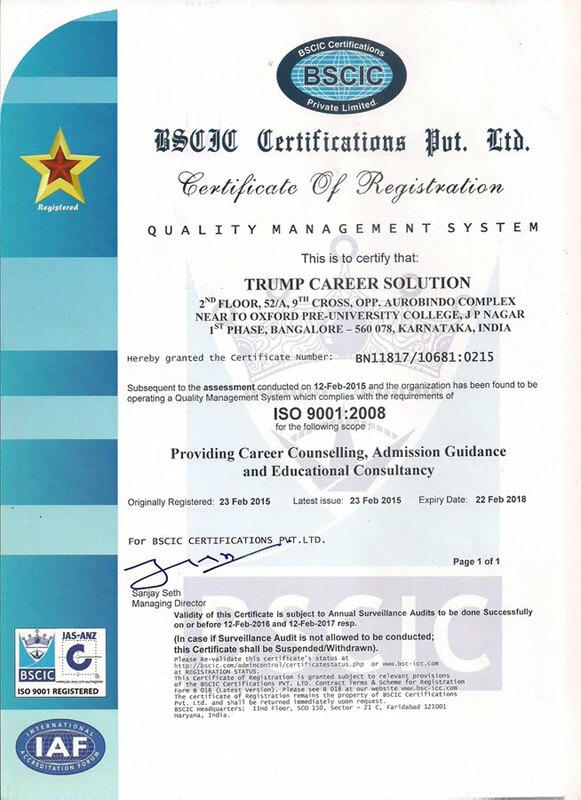 TRUMP Career Solution (An ISO 9001:2008 Certified Company) based in Bangalore, specialise in Management Quota Admission & Career Guidance for MBBS, BDS, Engineering (B.E./B.Tech), MBA, PGDM and other Professional Courses in India. We provide a different outlook and perspective of seeking Medical Education in India (Mostly in Karnataka & Maharashtra) for Management and NRI quota seats only. With the experience of more than 08 years and a team of educational experts from India, we provide dual assistance and have the specialization in the field of providing quality admission guidance for education, commitment of best service and offer personalized approach to all the aspiring students. We understand the Medical Education system and hence it is able to bring a clear picture to the prospective students and their parents about the steps to be taken care during the time of admission. TRUMP Career Solution in long lasting relationships with the students and we measure our success in terms of success achieved by our students placed in top medical colleges and Universities in India. TRUMP Career Solution is one stop shop for education queries and opportunity in Medical education guidance. We take care of all application aches. We ensure that you are applying to the educational institution that best fits your profile and that your application is complete. Disclaimer: This advertisement is regarding guidance for admissions through Management Quota in a Private Medical College. The listed college is not subjected to any authorization with us and also in no way concerned with this advertisement. People may seek out information from this advertisement that they find agreeable, either from the viewpoint of informative and easy to make use of or from the viewpoint of having content that matches individual’s need. It is the decision of viewer contacting us. Booking in advance for 2016 batch in most of the colleges is going on. So call us and Book your seats, at very modest and genuine rate. !! Seats are limited. Hurry Up!! !